Dan Runde at Shadow Government is 100% correct that the U.S. should work more closely with Brazil, but I'm not so sure about his arguments to that effect. He says it should be a priority to name a high level ambassador, seemingly not knowing there already is one (Thomas Shannon). He says Brazil has been too self-involved to have a good relationship with us, not seeming to realize that insulting the country is not the best way to generate cooperation. He labels Dilma Rousseff as "Pro-American," seemingly not understanding that the term is simplistic and misleading. Finally, he says we need more government bureaucracy in order to have a good relationship, which is odd given that the blog is conservative. But maybe U.S.-Brazilian relations could be a bipartisan project, even if there is disagreement on specifics. Actually, one last point. Is "influencer" a real word? Collin Laverty at the Center for Democracy in the Americas has a great (and lengthy) analysis of Cuban economic reforms and optimal U.S. responses: Cuba's New Resolve: Economic Reform and its Implications for U.S. Policy. It is a highly detailed (including 127 endnotes) and quite balanced analysis of why the reforms are occurring, how likely it is they will last, and how Cubans perceive them. Their main conclusion is that the reforms are halting, imperfect, and difficult, but are here to stay. The following is a great way to sum up how U.S. policy toward Cuba should be formed. We believe the right way for the United States to assess the reforms is to ask whether they will enable Cubans to lead more prosperous lives and then determine how our country can best support this process. Economic stability in Cuba would allow its citizens to better share in civil society and in participatory politics (p. 60). For those who support continuing the embargo, Cubans becoming better off right now is actually viewed as bad--we've been trying very hard for decades to keep them impoverished. If they become more affluent, this argument goes, they will support the dictatorship more. That is, of course, the exact opposite of what the U.S. argues for every other country moving away from Communism. Imagine the following. After a close race in 1960, Richard Nixon goes nuts, starts living in a tent with his followers in Washington, DC, and then travels around the country telling everyone he sees that John F. Kennedy is not the real president. Given that situation, do you think he'd have a chance to win again in 1964 or 1968? That is essentially what the PRD is hoping for now, because the party nominated Andrés Manuel López Obrador as its presidential candidate for 2012. The person who is likely the happiest with that outcome is the PRI's Enrique Peña Nieto, who now solidifies his position as favorite. We've got another year to go, so a lot can happen, but AMLO starts in a deep hole. There is a large chunk of the electorate that simply won't vote for him. A recent poll showed 35% of Mexicans had a negative or very negative view of him. This headline from Fox News Latino caught my attention: "Growing Number of Migrants are Leaving US for Latin America." This didn't make much sense to me. There has been abundant evidence that migrants are not leaving in large numbers, and we just learned that remittances to Latin America are up, which means people are staying abroad. So what is the evidence that they're leaving? When the United States economy tanked after the real estate bubble burst, undocumented immigrants returned in droves to Latin America, especially those who worked in the construction sector, according to a study from the Economic Policy Institute. Since then, the return rate has decreased but is still higher than usual, advocates say, citing anecdotal evidence. Ouch. News stories should never be based on advocates citing anecdotal evidence. Circular migration is eternal, which means you will always find people who are leaving, but that is not equivalent--at least yet--to a trend of more people deciding to leave and never return. In other words, this could be a trend, but the article fall far short of providing evidence for it. It would, in fact, be a welcome one since it would indicate confidence in Latin American economies. But I am not yet convinced. Charles Shapiro at UCSD's Institute of the Americas has an op-ed in the Miami Herald about how the United States ignores Latin America. I recently commented on another similar type of argument, and have the same reaction. I do not agree that Latin America's reaching out to Asia and other parts of the globe have much to do with the United States. That process was occurring regardless of what the U.S. did. One of my objections to these arguments is that they implicitly (or perhaps even explicitly) suggest that if the U.S. had somehow paid more attention, it could have prevented China from becoming more influential. I don't see how. Does anyone really believe that if the U.S. Congress had ratified the Colombia FTA in 2006, that China would be less influential? Such an assertion is too U.S.-centric for my taste. China wants commodities and will pay well for them. The United States cannot do anything about that capitalist reality. If George W. Bush had paid tons of attention to Latin America, that reality would not have changed one iota. If in your spare time you write about Obama and immigration, but the result is much too long (5000ish words) for a blog post and much too pitched at a general audience for an academic article, then what to do? The answer: see if you can sell it. If you have a Kindle or a device with the Kindle app, then my Obama's Immigration Problem and What it Means for 2012 can be had for 99 cents through Amazon. Whether anyone buys it remains an open question, but it's a fun experiment. Just yesterday I referred to Roger Noriega, and by coincidence today saw this short paper he just published about Hugo Chávez. There is so much wrong in so few pages that I hardly know where to start. First, he cites anonymous sources, which he's done in the past with truly ridiculous claims. Why should we trust these supposed sources? Because, he says, they have given him "reams of documents." Make of that what you will. Second, he claims that in 2003 he started the policy of not antagonizing Hugo Chávez. That is frankly laughable. The early part of the Bush administration was a disaster in that regard until Thomas Shannon took over. You will not find many people outside Roger Noriega who think it was due to Roger Noriega. Third, he claims that Venezuela is at war with the United States. That is too absurd to comment on, really. Fourth, he claims that both China and Russia are in a "conspiracy" (Noriega's term, not mine!) against the United States. He does not explain what this conspiracy is all about, but says they want to do "bad things." That is a direct quote. What these "bad things" consist of is left to our paranoid imagination. It seems the main idea for the article was to discuss the political implications of Chávez's cancer, which is a good topic, but Noriega spins out of control within the first few sentences. The State Department argues that having ambassadors in Quito and La Paz would facilitate contacts and allows us to work—despite our chasm of differences—on themes of common interest. But its limp-wristed, turn-the-other cheek diplomacy hardly serves to defend U.S. interests and prestige. This is the best criticism Romney's key adviser has? Just quoting Roger Noriega (who spouts truly crazy stuff) and then claiming President Obama sashays around Latin America? Let's go back to the Bush era when our prestige was so high...oh wait. Would you like to know how much the U.S. government cares about human rights abuses in Honduras? This State Department Q&A tells the story. MR. TONER: I think we did issue those. I thought we did, Matt, before the briefing. My apologies if we did not. MR. TONER: But there is a taken question that’s been released. MR. TONER: Yeah. So I’ll point you to those. Anything else? QUESTION: Okay. Well, can I ask someone to read it? QUESTION: Does it actually answer the question? Now, my bet is that it doesn’t answer the question. MR. TONER: This is so real time. It’s so connected. QUESTION: My bet is that the answer is not very responsive. MR. TONER: It does speak to our ongoing dialogue with – on human rights issues with the Honduran Government, and it certainly talks about our work with the Honduran military to build a better, stronger institution, no doubt, but also to build one that’s respectful of human rights and also – go ahead. QUESTION: I just – I don’t see anything in here about elite DEA commando squads launching raids and – but anyway, I’ll talk to you about it later. Thank you, though, for the taken question. MR. TONER: Very good. Are we done? Thanks, everybody. No need to answer the questions, just have a good laugh and then go home. Barbara Walter and Alberto Díaz-Cayeros argue at The Monkey Cage that Mexican DTOs constitute an insurgency. Or sort of. The violence in Mexico may not be a classic insurgency , but it is certainly being fought like one. Like other insurgencies, the violence in Mexico – especially the brutal killings of government officials and civilians – is being used to intimidate local populations and control territory. I don't really understand this argument. The main problem is that they do not define insurgency. Many types of political violence--civil war and terrorism come to mind--are used to intimidate local populations and to control territory. In other words, intimidation may be a necessary condition, but it is definitely not sufficient. Interestingly, the three studies they cite--Ken Eaton, Matt Ingram & David Shirk, and John Bailey & Lucia Dammert--are focused on crime and police reform, not insurgency, which they don't even mention. The question that arises, then, is whether DTOs should be treated like insurgents or like criminals. The two are very different. 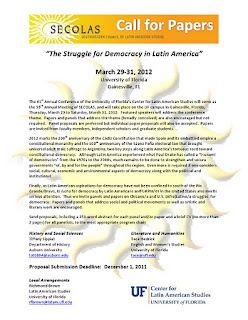 Shannon O'Neil links to a Brookings Institute study regarding the middle class in Latin America. The study is extraordinarily optimistic about how large the middle class is. Yet a quick look at some data left me scratching my head. Take El Salvador. Brookings says 46.8% of the country was middle class in 2005. But ECLAC (Table 16.1) says 48.9% of the population was poor in 2001, and 47.9% was poor in 2009. So half the country is middle class and half is poor? Take Guatemala. Brookings says over 33.8% of the population is middle class. ECLAC says 54.8% is poor. Or take Mexico. Brookings says 60% of the country is middle class. ECLAC says 34.8% was poor in 2008. If you accept both reports, then somehow the wealthy have largely disappeared in Latin America, and presumably the Gini coefficients we always see are wrong. Otherwise one or the other is off. This is especially true because poverty rates fail to describe those who are just above the poverty line but at any moment could fall back--perhaps Brookings would label them middle class. Poverty is gradually--albeit very unevenly--decreasing in Latin America, but we need to be careful about announcing the existence of large middle classes. At least the General Accounting Office appears to be sane, since no one else is. It is well documented, and I mean beyond a shadow of a doubt, or even a shadow of that shadow, that high-tech border solutions fail to achieve even a tiny fraction of their goals. They are very expensive, shiny, and PR-happy, yet worthless. I've been writing about this for years--here is one post from earlier this year that links to older posts. So we know they fail, but U.S. Customs and Border Protection wants to push on anyway in Arizona, perhaps hoping to fail as spectacularly as in Texas. Fortunately, the GAO has just made clear in a report that it does not have enough evidence that it will work. Instead, we get an image of a government agency just trying to do something, without caring at all whether the money spent is a waste. It is indeed pretty scathing. Specifically, GAO's review of the estimate concluded that the estimate reflected substantial features of best practices, being both comprehensive and accurate, but it did not sufficiently meet other characteristics of a high-quality cost estimate, such as credibility, because it did not identify a level of confidence or quantify the impact of risks. GAO and OMB guidance emphasize that reliable cost estimates are important for program approval and continued receipt of annual funding. In addition, because CBP was unable to determine a level of confidence in its estimate, it will be difficult for CBP to determine what levels of contingency funding may be needed to cover risks associated with implementing new technologies along the remaining Arizona border. Emphasis mine. Is this really the best we can do? My head is dented from banging it against the wall. Interesting announcement from the State Department regarding Bolivia and the restoration of normal diplomatic relations, which Bolivia expelled the ambassador and the DEA in 2008. The "Framework Agreement for Mutually Respectful and Collaborative Bilateral Relations between the Government of the Plurinational State of Bolivia and the Government of the United States of America" outlines several critical areas for future collaboration between Bolivia and the United States. The Agreement’s objectives include strengthening and deepening bilateral relations, with respect for sovereign states and their territorial integrity; promoting human, economic, social, and cultural development in an environmentally sustainable manner; supporting cooperative and effective action against illicit narcotics production and trafficking, on the basis of shared responsibility; enhancing law enforcement cooperation; and strengthening the commercial relationships between Bolivia and the United States through the Trade and Investment Council. Hard to tell what this will mean in practice and media reports are not any more helpful, but in one sense the specific details don't matter. It serves no useful purpose for the two countries to freeze each other out, and it is good to see quiet back channels working effectively. Breaking relations helped neither country, and so hopefully this is a step forward. For Bolivia's sake, I hope it will include once again being included in the ATPDEA. I am waiting for accusations that the Obama Administration is aiding terrorists because Iranians dressed like Aymara are going to sneak across the border and bomb Arizona. You heard it here first. Warning: this has nothing to do with Latin America. Unless they come across something hidden in the ice in the Antarctic. I am a fan of 1982's The Thing. So when I heard there was a prequel, I was dismissive until I learned the "original" I liked was a remake of a 1951 film The Thing from Another World. Then I learned that even the original movie was based on a novella "Who Goes There?" by John W. Campbell., published in 1938. So I had to take a look. The novella is great fun, though I like the way the movie ends more. It's darker, and you can't beat Kurt Russell in the role of McReady. Other than that, the movie stays remarkably close to the novella, though it removes the more cheesy references to things like anti-gravity machines. Given how long ago it was published, however, that clearly wasn't too cheesy at the time--in fact, Campbell included a discussion of atomic energy (though not, in that pre-Hiroshima era, any reference to bombs). There is more or less constant criticism of the United States for not paying enough attention to Latin America. All too often, this is boiled down in a simplistic manner to delaying the ratification of trade agreements. The vast majority of such claims are overblown. Much more important, and much less remarked upon in the media, is simply how the U.S. government uses strong-arm tactics that alienate even its own allies. Take Chile. It is a close ally, committed to capitalism, resistant to populism, you name it. But when it comes to foreign policy, both the Bush and Obama administrations treat it like a child. In 2003, Chile refused to vote in favor of use of force in Iraq, and Donald Rumsfeld made threats, which were criticized by the left and the right. Now in 2011, Chileans both of the right (even the far-right UDI) and the left are complaining about the Obama administration's "stick out my tongue, take my marbles and go home" approach to UNESCO, which made the Palestinians a member. If the entire ideological spectrum in Chile criticizes U.S. strong-arm tactics, then you have a perfect example of how the U.S. is failing in Latin America. With certain policy decisions, the U.S. is isolating itself from the rest of the region, and that has ripple effects to other policy areas. Why follow a country that will react so strongly when you disagree? Thanks to Otto, who found a solution to Google Reader's removal of the share feature. Here is info on a Google Chrome extension that simply brings it back to life. I use Google Chrome so it worked immediately, though it appears also to be available for Firefox. Now I can just go back to doing what I liked before Google made "improvements." Migrants living in the U.S. are sending more money home to take advantage of the weakening peso, which slid to a more than two-year low on Sept. 23, said Sergio Luna, chief economist at Citigroup’s Banamex unit. Historically more than 95 percent of remittances to Mexico come from the U.S., according to the Washington-based Inter-American Development Bank. The surge in remittances indicates more Mexican workers in the U.S., particularly in the construction industry, are finding work, said Alfredo Coutino, Latin America director at Moody’s. Construction spending in the U.S. increased in September for a second month after reaching an 11-year low in March, a Commerce Department report showed on Nov. 1. The U.S. economy, the destination of about 80 percent of Mexican exports, expanded at the fastest pace in a year in the third quarter. What it also likely means is that we will see an uptick in border crossings, both legal and illegal. From the Federal Reserve Bank of Dallas, news of an economic slowdown in Mexico. Exports fell 3.6% in August, the sharpest drop in two years, but year to date are still up 17.1% (though that is down from 32% last year in the same period). Nonetheless, GDP in the third quarter of 2011 is expected to be 3.5% higher than last year. Given the high-profile violence, that's nothing to sneeze at. The latest data suggest a slowing is under way in the manufacturing and international trade sectors; both industrial production and exports dipped in August. Retail sales also ticked down in August and although employment growth picked up in September, third quarter job growth was down from earlier in the year. The peso fell consid-erably relative to the dollar in September, and inflation eased. Proving once again that currently the main beneficiaries of the immigration debate are lawyers, the DOJ is suing South Carolina for infringing on the federal government's authority to make immigration policy. I am opposed to the restrictionist state measures floating around out there, and they need to be challenged, but the ironies here abound. The federal government argues that it has sole authority to enact immigration reform, then refuses to do so. Meanwhile, states complain about budget problems and then pass extremely expensive enforcement measures they know will face costly challenges. So everything goes into the courts. My advice: if you are currently in law school, check out immigration law. Like the Border Patrol, it may well be recession-proof. James D. Bowen, "Multicultural Market Democracy: Elites and Indigenous Movements in Contemporary Ecuador." 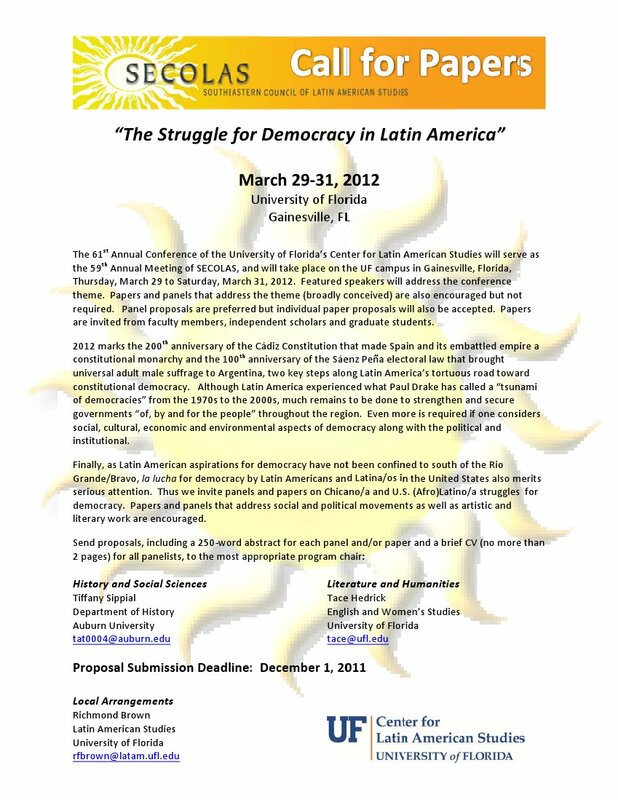 Journal of Latin American Studies 43, 3 (2011): 451-483. This paper bridges the gap between studies of subaltern social movements and elite politics by asking how political and economic elites respond to indigenous mobilisation in Ecuador. I argue that elites have developed a hegemonic project based around three core principles – multiculturalism, economic liberalism and democracy – that serves to incorporate indigenous peoples into the political system while simultaneously excluding indigenous movement demands that would undermine the political and economic sources of elite power. The paper develops this argument around a concept of what I call ‘multicultural market democracy’ based on historical analysis and in-depth interviews with 43 Ecuadorian elites. After over two decades of continuous organising and frequent mobilisation, indigenous peoples have been incorporated largely into the Ecuadorian political system. Incorporation, however, has come at a price. The principles of multicultural market democracy have proven quite useful to a diverse group of elites (with equally diverse interests) when confronted by the alternative political-economic projects presented by indigenous movements. Even the current president, Rafael Correa (generally considered part of the wave of ‘new Left’ leaders in the region), follows a similar script. Ecuador, and now increasingly Bolivia as well, has been hard to characterize despite media efforts to make it into a caricature. Even when presidents are sympathetic, state-indigenous relations can still involve friction and discrimination. This article presents a particularly pessimistic view, showing how indigenous groups have become more influential yet there are clear limits to that influence depending on what type of redistributive project they have in mind. Fair enough, though it is also useful to view them in comparative historical terms, as indigenous rights have come a very long way in the past several decades. For several years, I have happily used Google Reader to read blog posts and share them. Blogger has a widget that makes my shared blog posts show up on the right side of the page, which I liked because it was a really fast and easy way for readers of my blog to check out other bloggers that I found interesting. As of today, however, Google has eliminated sharing. Instead, everything has to go through Google+, which I find annoying. At this point I have not figured out the optimal way of easily sharing blog posts I like, so if anyone has any ideas feel free to comment. I wouldn't mind just doing it through Twitter, but there doesn't seem to be a way to do that either. If there is another reader service that can do it, then fine--I am not wed to Google Reader. Update: for potential solution, see here. When the Colombia FTA was ratified, I thought we'd be done with bad analyses about it--and there were so many--but unfortunately I was wrong. From Bloomberg/Businessweek, we get the argument that the late passage was a total disaster because it prompted Colombia to strengthen ties to China, Europe, the rest of South America, and to Canada. This is a strange argument because it suggests that Colombia did not have access to U.S. markets before the FTA was passed, but of course it did through the ATPDEA. The main benefit of the FTA was not to give Colombia more access, but rather to make the relationship permanent and eliminate the need to keep renewing the ATPDEA (which was indeed a pain in the neck). In short, Colombia did not suddenly look elsewhere for trade because of the refusal to ratify the FTA. It kept exporting to the U.S. while simultaneously expanding trade with other countries. Next, the argument makes it sound like China came to Colombia because of the absence of an FTA. But we all know that China is going everywhere, including countries that already have an FTA with the United States. In fact, China signs its own FTAs with countries that already have U.S. FTAs, such as Chile. China would have increased economic ties to Colombia even if the FTA had been passed seven years ago. This article, like many others, cannot seem to grasp the fact that Latin American countries do not base all their decisions on the United States. It also cannot grasp the fact that FTAs do not somehow lock other countries into trading only or even primarily with the United States.